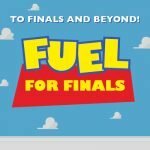 Stay energized for the finals by fueling up by CHSS Promenade, Building 57, The Grove Patio or the sidewalk behind Papago 47 on Tuesday, Apr. 16 and Wednesday, Apr. 17!